"This is a delicious dip that can even be served as an entree along with tortilla chips and a salad. For a tamer version of this dip, use mild taco sauce. Enjoy!" In a large skillet, brown ground beef and drain. Add refried beans, spicy taco sauce, chili powder and cumin. Spread this mixture into a 9x13-inch baking dish. Spread sour cream over meat mixture. 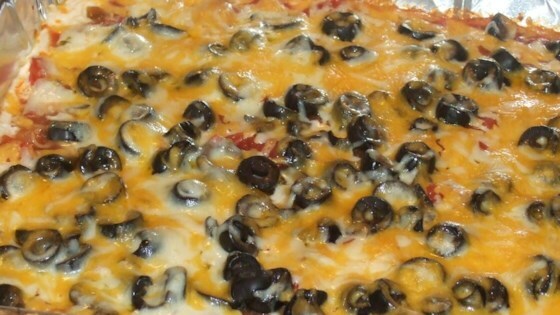 Layer onions, tomatoes, olives, and hot pepper cheese over the sour cream. Top with the cheese. This was good. I changed it up a little to suit our tastes. I used taco seasoning packet and tomato sauce instead of water for the taco meat, and I added chopped red pepper on top. Alright...kind of boring. It gets 3 stars because my husband liked it enough. I added crushed taco shells between the meat and veggie layers for a taco casserole! Something different and yummy!